This sweet kit includes a ceramic mug, chocolate cake mix, and multi-colored sprinkles. Of all the birthday gifts, this mug takes the cake. Send the chocolate lover in your life this sweet kit that includes a ceramic mug, cake mix for two microwave "cup" cakes, and—because no birthday is complete without them—multi-colored sprinkles. All that's needed is egg, oil, water, and friends to share with. 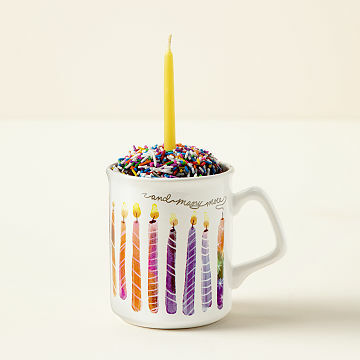 The mug is festively decorated with colorful drawings of candles, and can be used over and over again so they'll never forget the special day. Made in Canada. Candle not included. Packaging: 5.2" H x 5.2" Dia. Not included, but needed: egg, oil, water, or candle (optional). Son loved the idea as he's currently 1500 miles from home. Birthday cake in a mug! Such a fun gift for the person you can't be with to celebrate especially. I wasn't sure if my Dad was even going to get a cake for his bday so this way I could help that! Get this for the cup not for the cake!!! Neat idea for a birthday gift. But the cake in the cup wasn't great. Couldn't get the right consistency. It tasted ok. My grand daughter was pleased with the cup! I am very pleased! They are big mugs and sturdy. They are already packaged and ready to give as a gift. My sister called when she received it and loved it! The mug is brightly decorated and festive and she loves yellow cake with sprinkles! It is perfectly packaged and makes a delightful presentation. Friend was shocked that I actually remembered her birthday and she was thrilled that the cake actually tasted good. Made everyone's day a bit brighter! quick and easy and so much fun! perfect, makes enough for two people. buy your own candle though, it doesn't come with them.